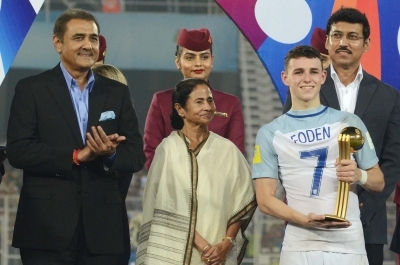 Kolkata, Oct 29 (IANS) West Bengal Chief Minister Mamata Banerjee on Sunday thanked the FIFA and AIFF for giving the state the chance to host the U-17 World Cup Final match. “Today is a historic day for Bengal as well as India. For the first time, the U-17 World Cup football final has been hosted at Vivekananda Yuba Bharati Krirangan this evening. My sincere thanks to FIFA and AIFF for giving us the opportunity to host the final match,” Banerjee said in a Facebook post. “I was present at the prize giving ceremony. My heartiest greetings and best wishes to the wining and participating teams. It is indeed an overwhelmingly proud moment for Bengal and India,” she added. The All India Football Federation’s National Centre of Excellence will come up in Kolkata, AIFF president Praful Patel had announced recently. Patel made the announcement after Banerjee offered 15 acre of land at Rajarhat in the city’s northeastern fringes.